My flight was departing from another terminal, so the drive from the lounge took about 10 minutes. We pulled up by a jetway connected to door 1L and walked up the stairs. I was the only one to board through that door – a whole jetway just for me? Brilliant! The cabin is a single row of 1-2-1 suites. 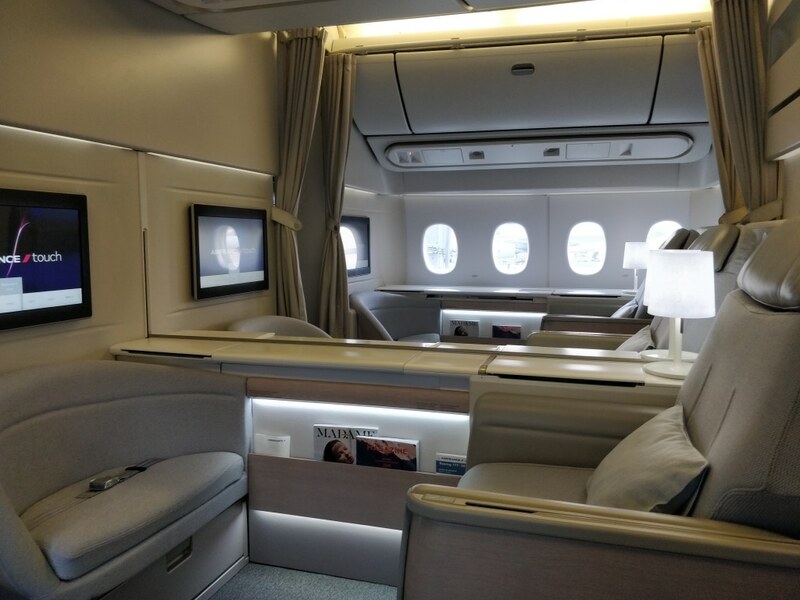 The seat is very wide and spacious, and spans over 4 windows on a 777-300. Unlike many other suites, it’s not enclosed in a hard shell, but has floor to ceiling curtains. 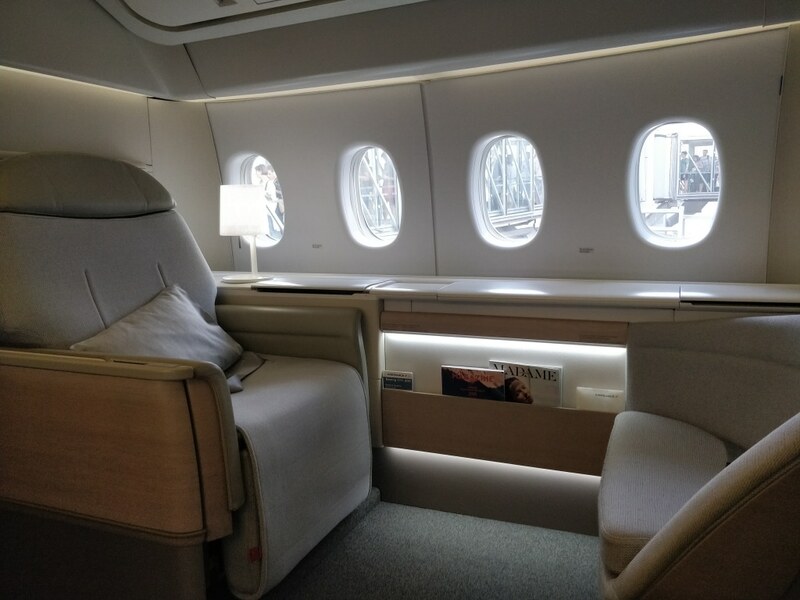 It’s the only product I know of with curtains, and I found it and elegant solution that made the cabin very airy and light during boarding, while still allowing total privacy for sleeping. 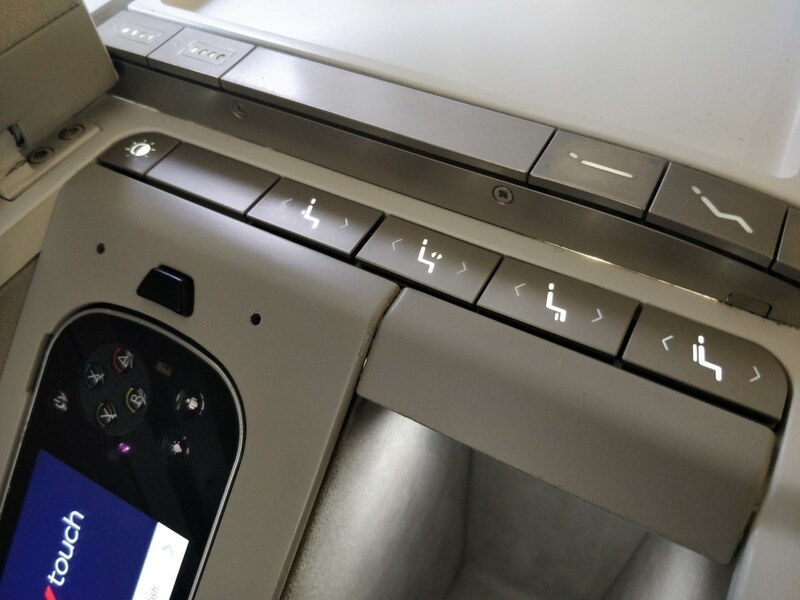 The seat also has an ottoman with a seatbelt, so you could dine together if you were travelling in a pair. There are three main storage areas: two compartments between the seat and the window and a drawer under the ottoman. The first has basic seat controls on the outside, and more comprehensive ones if you open it up. I do get an inordinate amount of satisfaction from controlling all the window shades with a single button. It also has the IFE controller and headphones, plus a USB and 110v outlet. The Bose QC15 headphones were wired directly into the compartment, presumably to deter those with sticky fingers. The second window compartment also has a 110v outlet and is next to the ottoman. As far as I could tell, the storage is identical on all four seats. There is also a drawer that slides out under the Ottoman for even more storage. I’m not sure you’re allowed to carry on as much as it would take to fill all the storage. 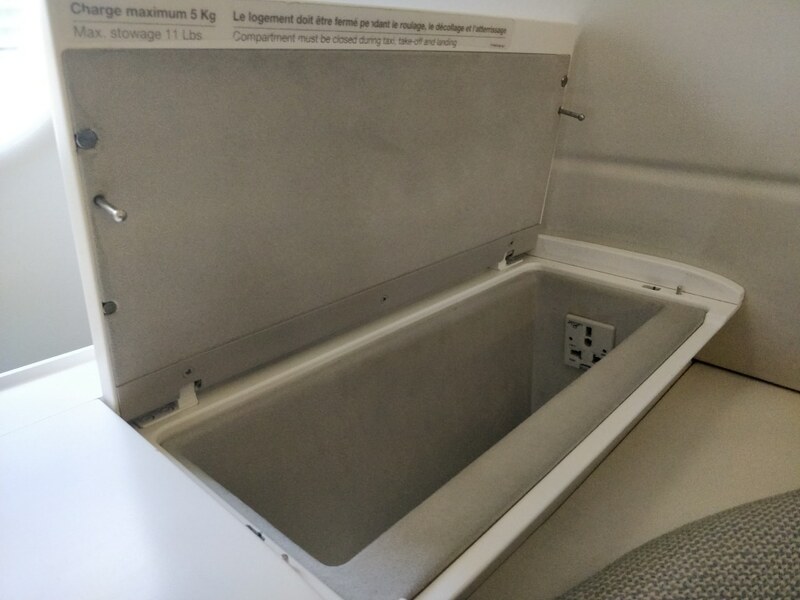 Just to be safe, there are overhead compartments too. Note the long queue of people still boarding. 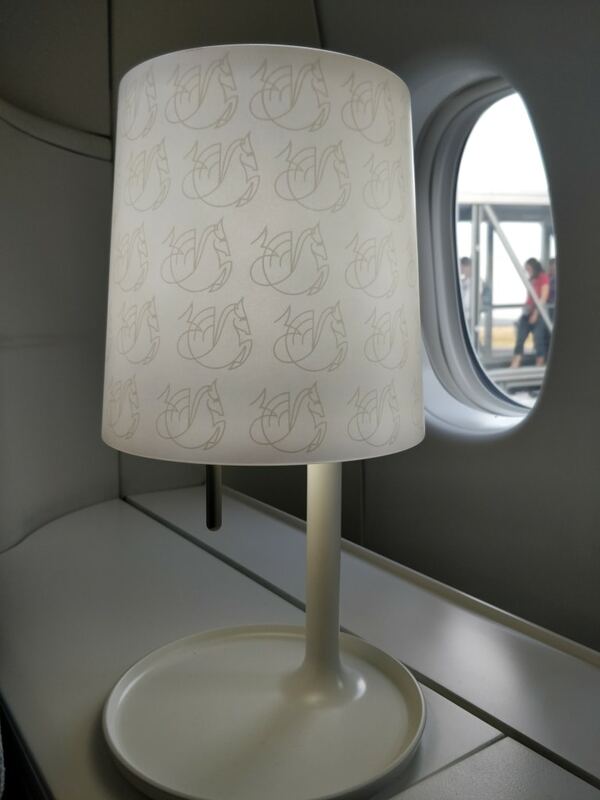 The seat also has a lamp with its own dimmer, which I thought was a nice touch. Beyond that there is nothing outrageous in the seat. 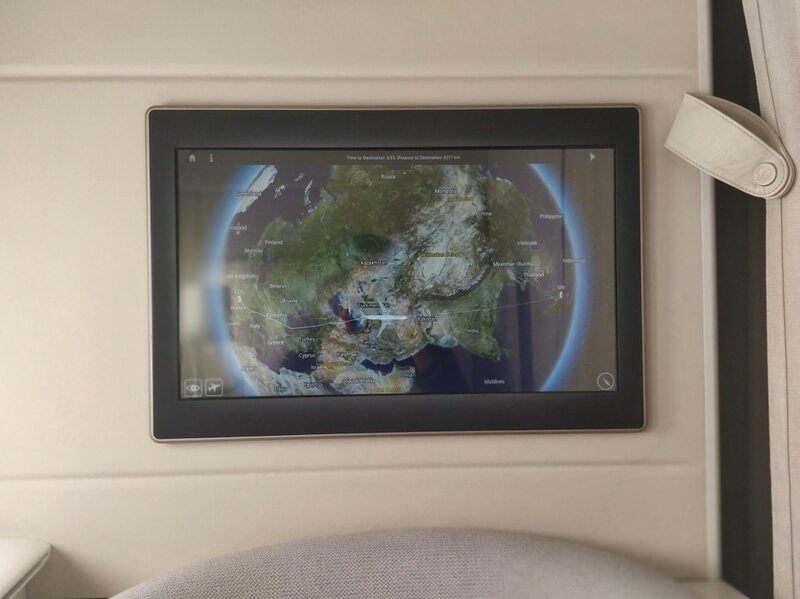 The screen is 24” and HD which is what you’d expect (unbelievably in La Premiere on the A380 it’s only 10”) . 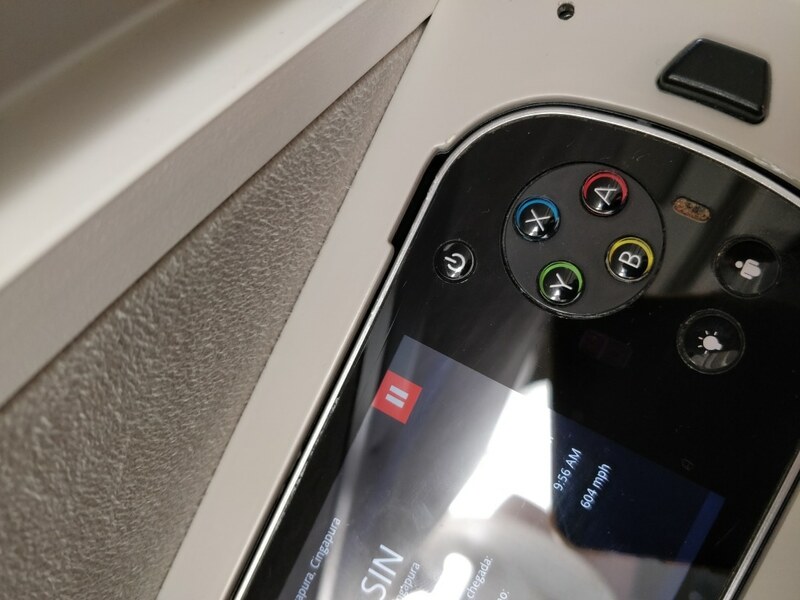 There is no gimmicky tablet controller thing like on EK, and the IFE controller is very similar to the SQ 2013 one in J. It was all fairly responsive and didn’t crash but was very much entry-level tech. A total of 3 staff stopped by to welcome me at various intervals including the Captain. He looked exactly how I hoped an Air France captain would – like a caricature of Gallic features and a cross between Gerard Depardieu and Obelix (of the Asterix and Obelix comic). I knew we were in safe hands. My slightly hurried departure from the lounge meant I thought I’d be the last on board, but boarding continued for a while after I was settled in. 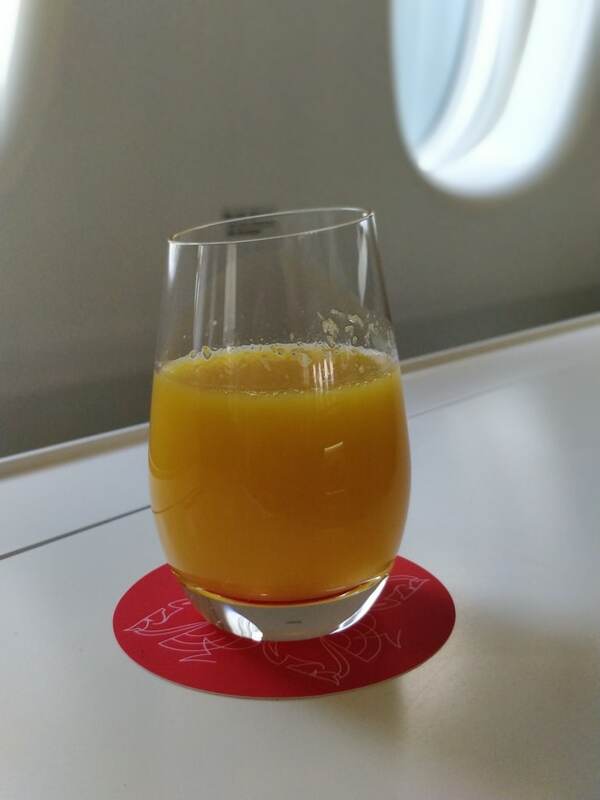 Still a little gun-shy from the whisky tasting, I opted for some orange juice as a PDB. 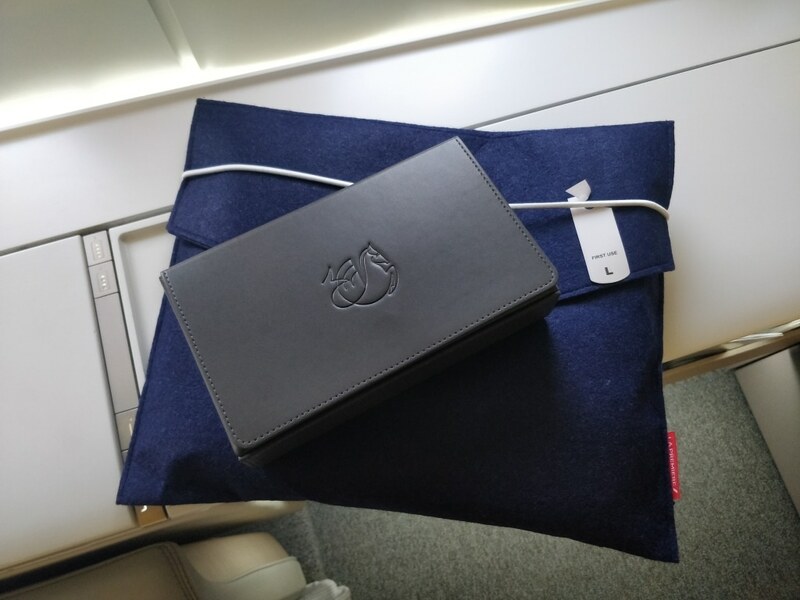 I was then bought pyjamas and an amenity kit. The amenities were by Carita, and according to people in the know, expensive. I didn’t pay much attention to them, but my notes say there was anti-aging cream, skin regenerating cream, hand lotion and a face mask (“masque”). 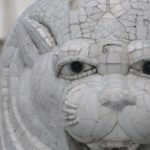 As I didn’t feel particularly old or in need of regeneration, or disguise, I ignored them. The kit also comes with a wooden comb, some disposable covers for the headphones, and a large, black eye mask. I thought I would find more use for the box the amenities came in, with its magnetic latches and fetching orange interior, but alas it has sat unused since my return. Finally, there was a luscious, weighty pen. The pen may actually be the best part of the kit, and I am very attached to mine. It remains the best pen I have ever received from an airline. Special mention should be made about the pyjamas which were a very pleasing dark blue (vs generic airline grey), thick and soft. They were extremely comfortable and are the first pair of airline PJs I’ve actually taken home with me in a very long time. Their case could, in a pinch, double up as a 13” laptop sleeve too. There were also some quite chunky slippers. 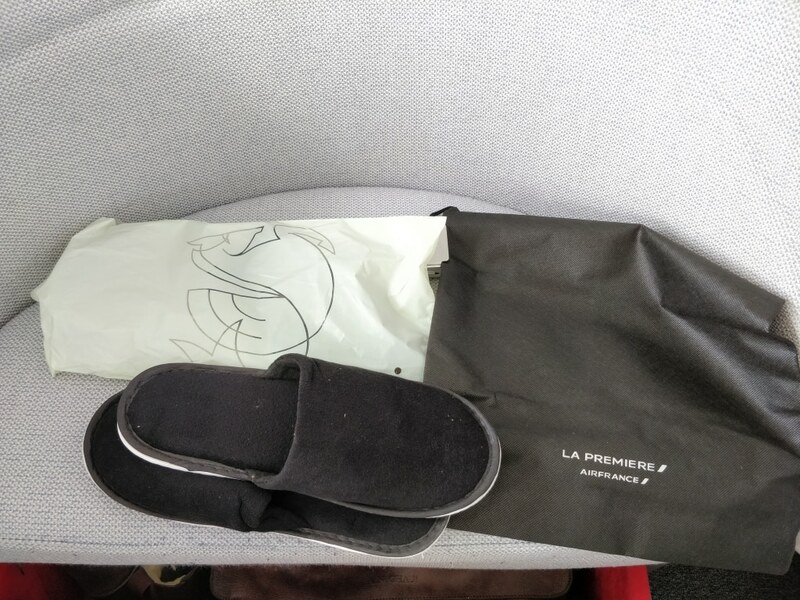 I tend not to get my hopes up for slippers because they hardly ever fit my feet and are usually too flimsy but AF bucked the trend. As boarding was dragging on I went to get changed so as to maximise my time with fitting slippers on. At this point I should mention that the bathroom was extremely underwhelming, in that AF had not done anything like making it bigger, or installing a nicer sink. 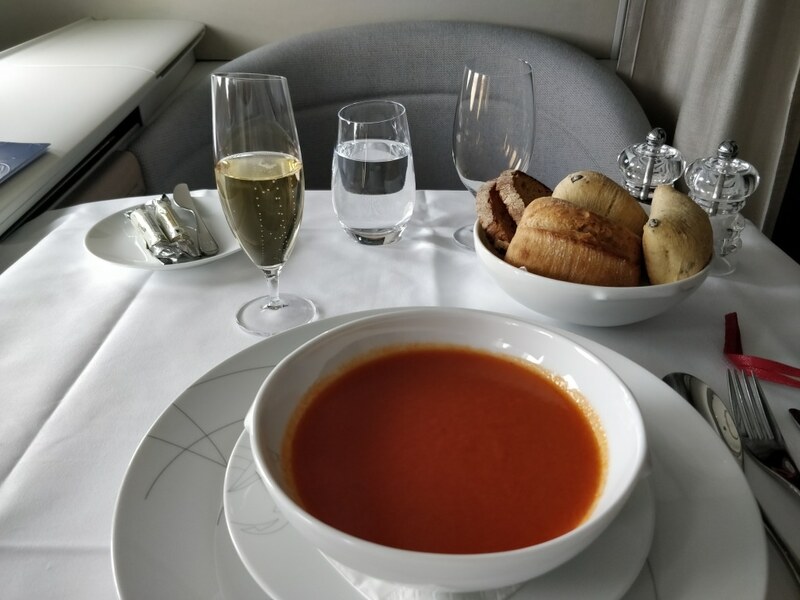 They just had the same standard 777 loo that you’d get in Y but with some flowers and an indifferent assemblage of hand creams and other potions. As far as I could tell there was only 1 bathroom for F too which might get problematic with a full cabin. After a while, the captain announced that our take off was delayed due to air traffic congestion over Switzerland. That was fine by me! 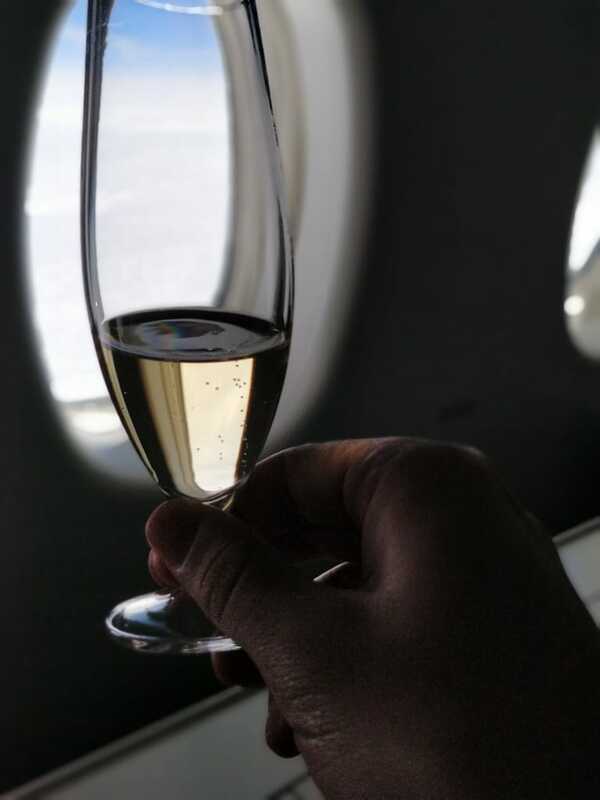 As we were about 40 minutes behind schedule with no signs of pushback, I decided to have a half pour of champagne. 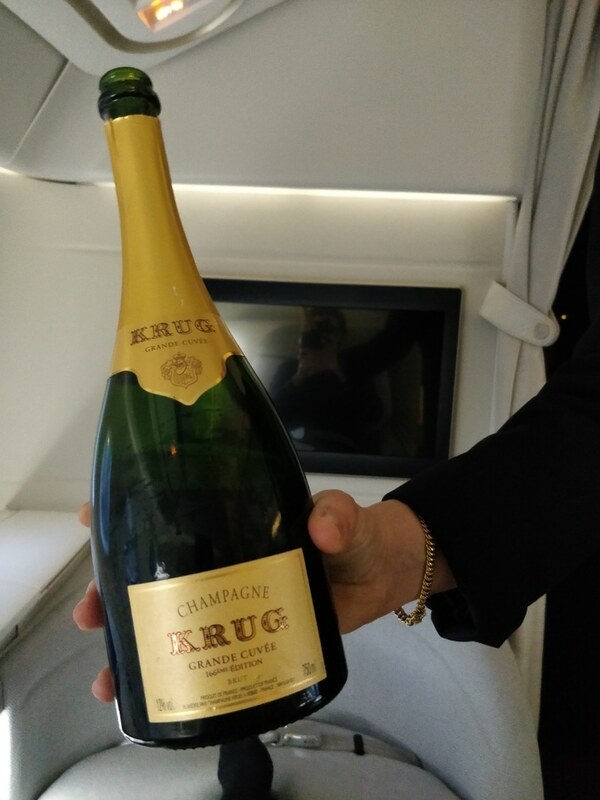 AF served Krug Grande Cuvee on this flight which I thought I would give another try (my last Krug encounter was in the heady days when QR had just opened Al Mourjan lounge and served Krug behind the bar) but it turns out I still don’t like it. I guess that makes me an uncultured heathen. Eventually, we pushed back about an hour after our scheduled departure time and the captain announced our flying time of 12:20 after which the safety video was screened. We had a brief take off roll and smooth climb. I was the only ticketed F passenger that day but there was an AF employee (he sat in the jump seat during take-off) in 1L. I barely saw him the whole flight, so it felt a bit like I had a private charter. With our ample time on the ground, I’d planned my flight with the purser. I’d use her name, but she never gave it and didn’t have a name tag or anything. 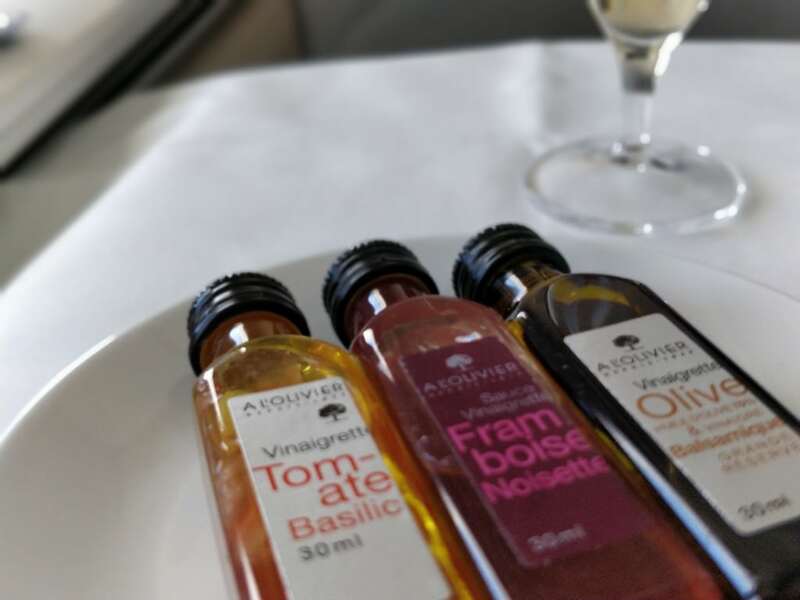 That seemed to be part of a bigger AF trend – none of the cabin crew introduced themselves by name on any of my flights, nor was I addressed by name. I’m not sure if it makes a difference to the service, but I did think it was a bit strange. My plan for the flight was to sleep immediately after take-off (which was close to 9:45pm after the delay) and get woken up at 9:30am Singapore time (about five and a half hours into the flight) to try and jump-start my body clock. I’d then have what they had planned for dinner at 12pm Singapore time and then relax until landing at ~4PM. Before discussing the bed, I’d like to list some final observations on the seat in recline mode. Mine (1A) felt a bit tired. Something was a bit loose, so that if you shifted your weight the whole chair would move a little. The latch on lid to the main storage compartment was broken. It was the push to lock type, but it kept popping back up which was a little irritating at first, but I dug deep and got over it. 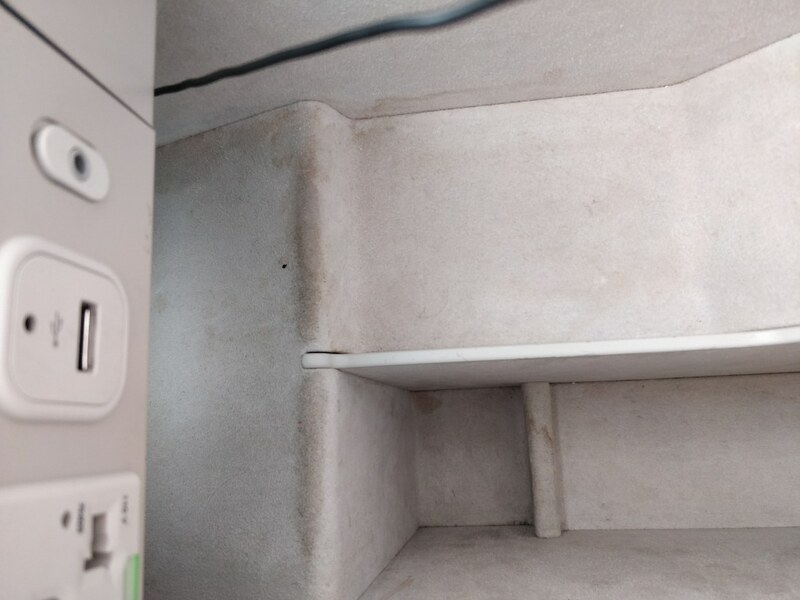 The main storage compartment also looked filthy, with a smorgasbord of stains and marks inside, and the IFE controller had grime and grease on it too. 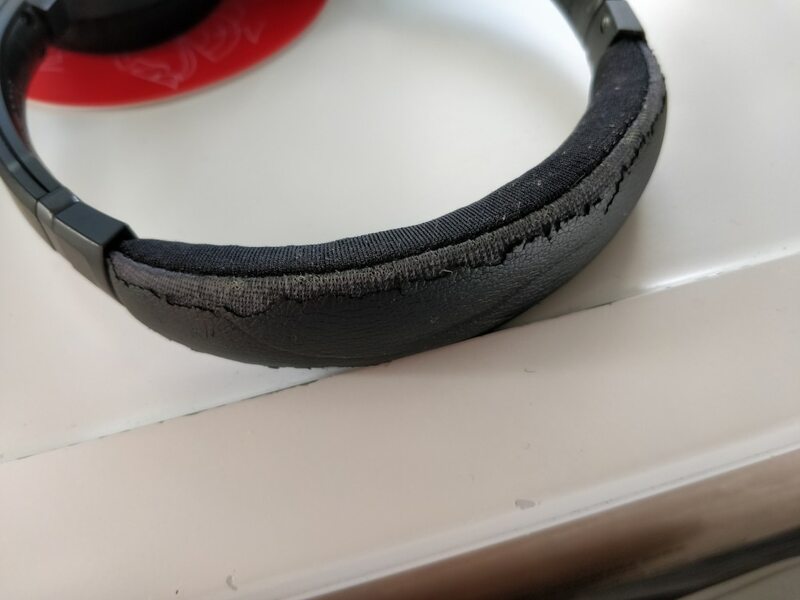 Finally, the headphones looked worse for wear too. It may well be that 1A sees a lot more use than the other seats because simple people like me seem to think it’s not really F unless you’re in 1A. If the dirt and headphones had truly bothered me there were 2 other seats I could have used, so it wasn’t the end of the world, but still a bit disappointing. Perhaps the ground staff had been on strike. As we climbed through ten thousand feet the purser sprang into action and began preparations for transforming my seat into a bed. She also reminded me that the ottoman is inaccessible when the seat is in bed mode. AF use a very thick (I’d guess 2-3”) mattress pad which was delightful. 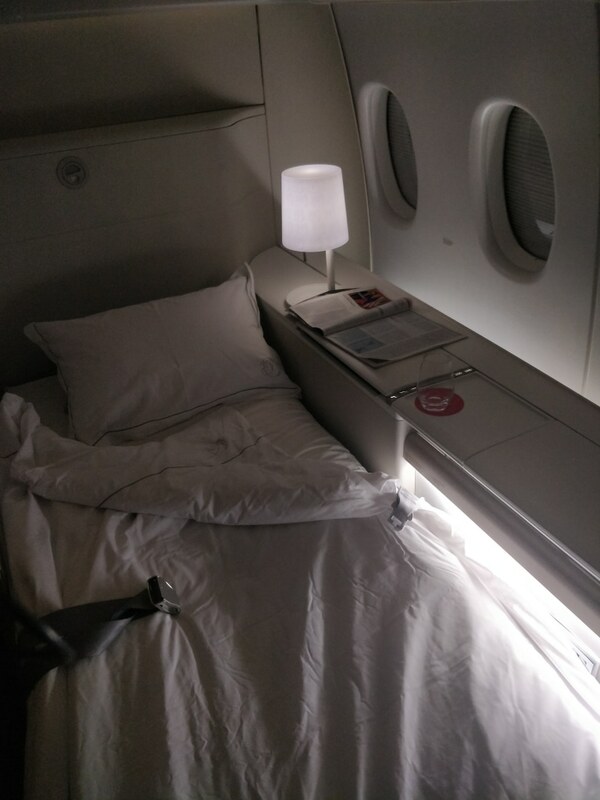 The bedding was crisp and plush, and I knew it would be a struggle not to sleep most of the flight. 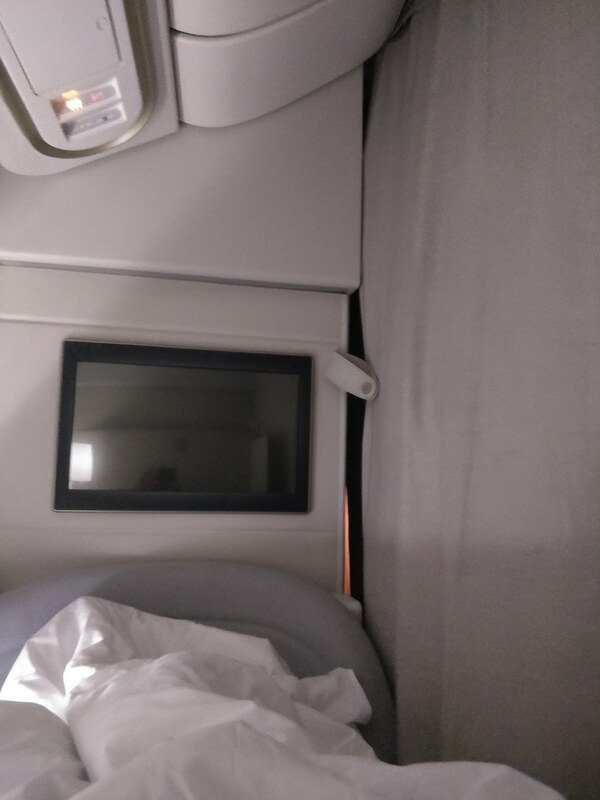 Furthermore, the cabin was kept deliciously cool, meaning that the quite thick duvet was a comfort, not a sweaty trap (looking your way SQ, CX). Once in bed mode, the seat has another adjustable reading light above the pillow, which was a thoughtful addition. I was soon in bed, with the curtains drawn and an unwavering feeling that life was pretty good. I slept extremely well and all too soon it was time to wake up. I toyed with sleeping another few hours, but I figured it was better to start adjusting to the 8 hour difference from Ghana ASAP. I ordered an espresso and some juice. The presentation and espresso were very good, but let down by the milk in a container which I thought looked tacky. 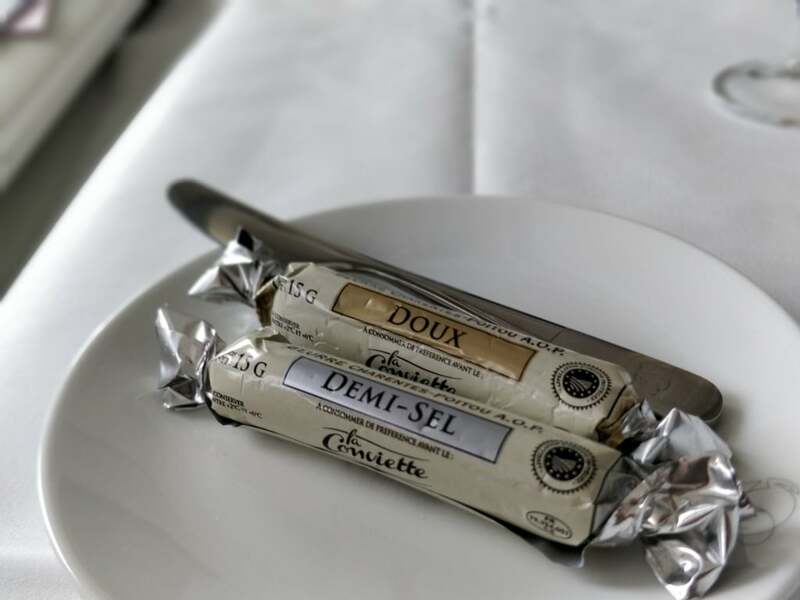 It came with some dark chocolates and lemon biscuits. I then read for a while, while contemplating my lunch. 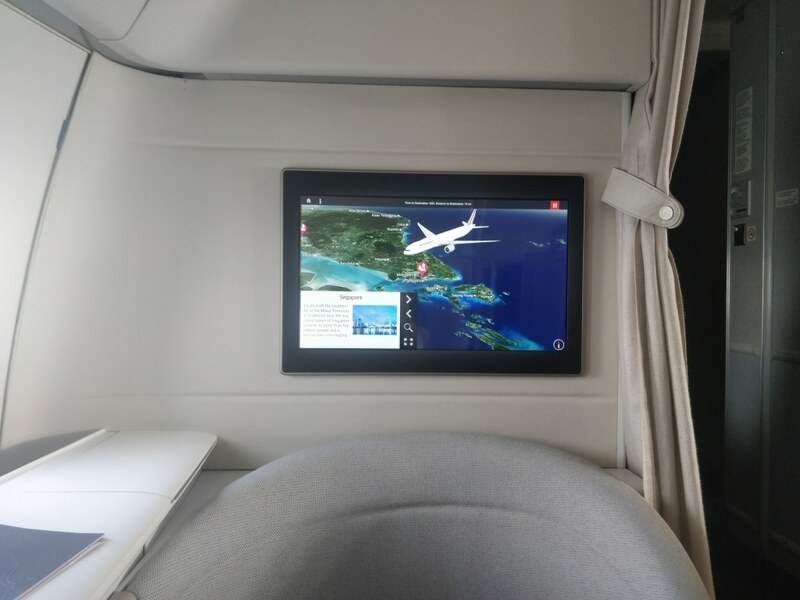 The cabin was extremely tranquil and reclining in one of the best F seats in the world and watching the clouds go past felt very calming. 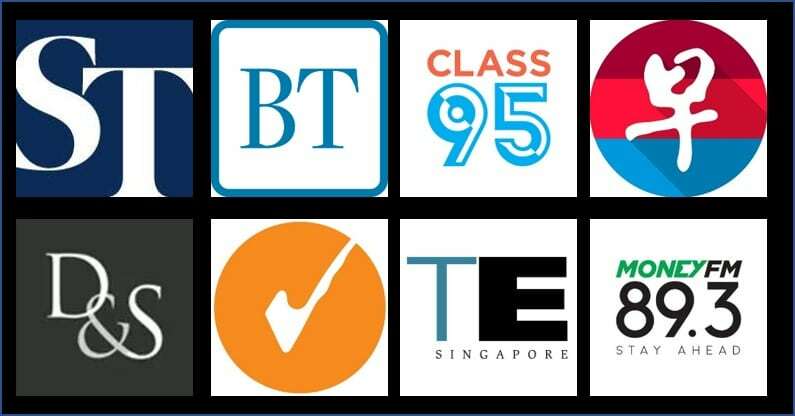 At 12pm Singapore time, lunch began. 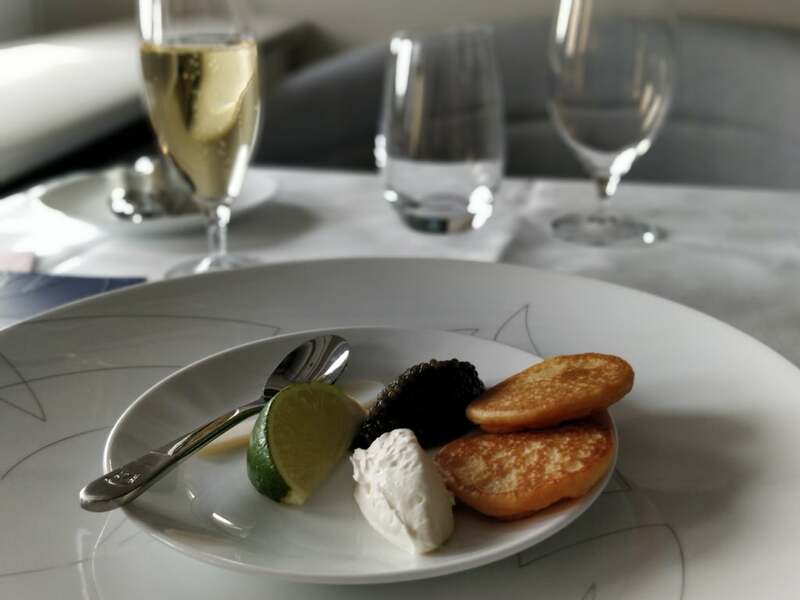 At the insistence of the purser, I had some Krug to go with the caviar. The eagle-eyed among you will notice that my glass remains stubbornly full throughout the meal. 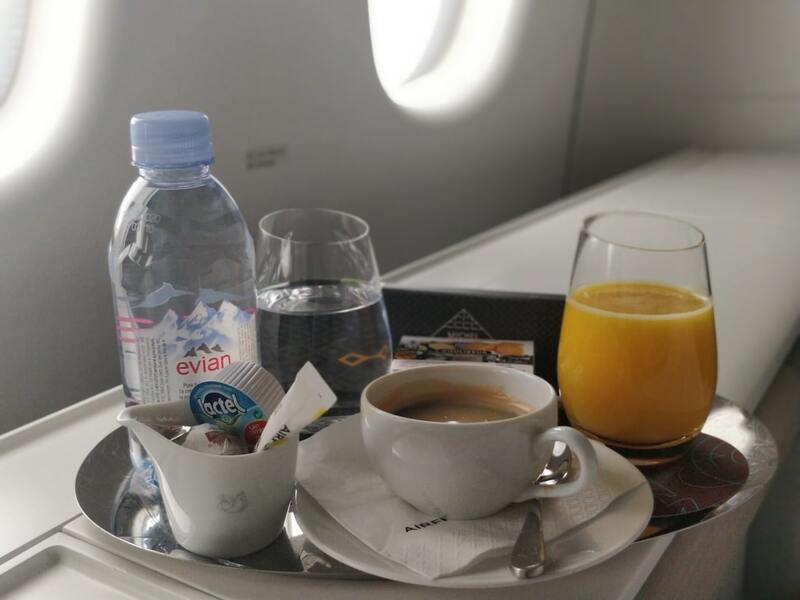 I really did try to like it, but I’m not sure that 30,000 feet is the best place to appreciate the subtleties of a masterfully crafted beverage. I guess you can revoke my airline blogging credentials for not fawning over Krug. The caviar was already plated (not in a jar) and pleasant enough, but unremarkable. The blinis were a bit soggy, but they’d been in an aeroplane for the last 7 hours so it made sense. Perhaps if I’d had my dinner after take-off they would have been a bit more lively. Next was the gazpatcho, which was phenomenal. It was full of flavour and actually tasted of, among other things, roast peppers. Left to my own devices, I probably would have just had that, but for you dear readers, I soldiered on through another three courses. At this stage I was also presented with a selection of bread and not one, but 2 types of butter. Vive la France! 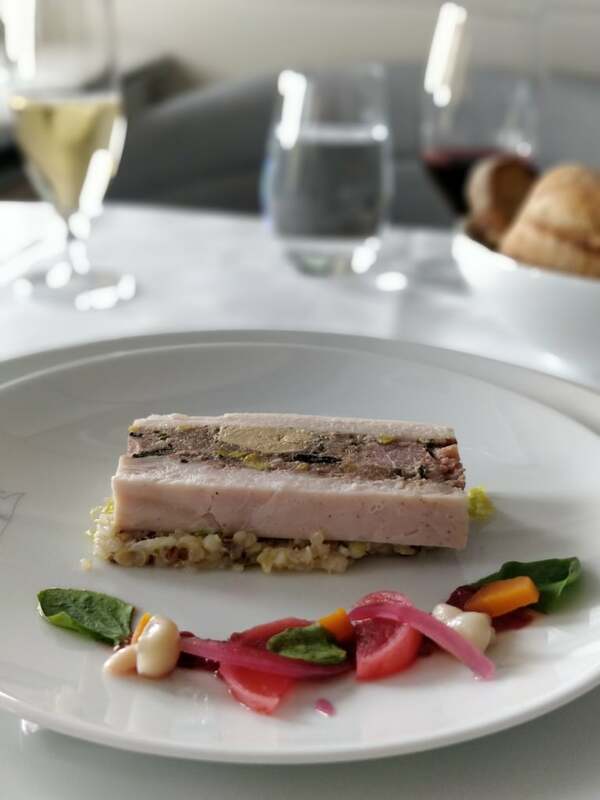 Next was the nougat de foie gras (foie gras nougat for the linguistically challenged). I think this is a tricky dish to pull off, but the chutney carried it over the line. Again, it’s a big ask to for anything to look or taste as intended after it’s been refrigerated for hours in a pressurised cabin. For what it’s worth, I think that the presentation was great. 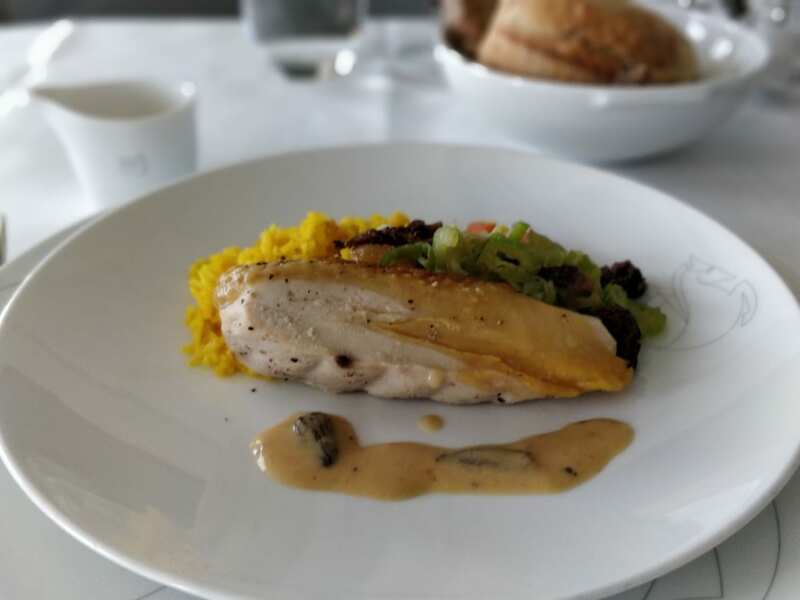 Next up, I opted for the chicken with black morel mushrooms and turmeric rice which came with a gravy with sultanas in it in a small branded jug. The presentation was underwhelming, and the dish a disaster. The chicken was tough and tasteless, which just left rice and a forgettable gravy. I should have gone with the lamb. Next up was the salad course. The curveball mid meal salad is, I believe, uniquely French. I quite like it. 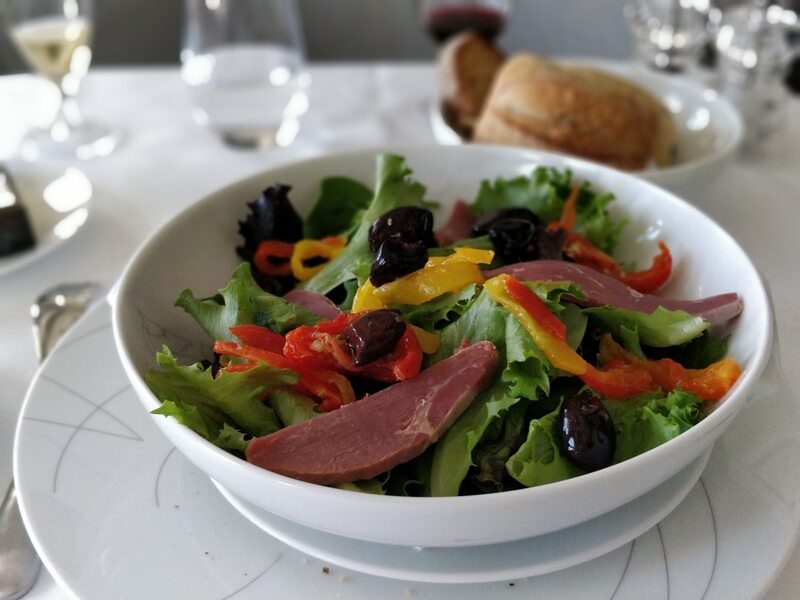 I opted for olives, sun-dried tomatoes, mixed peppers and duck. It came with a choice of three dressings. It was a good salad. Look at you reading about someone on the internet who ate a salad. If I were made of sterner stuff, I would have opted for some cheese. However, my liver was starting to object after 24 hours of abuse, so I opted to go straight to Port and pudding. 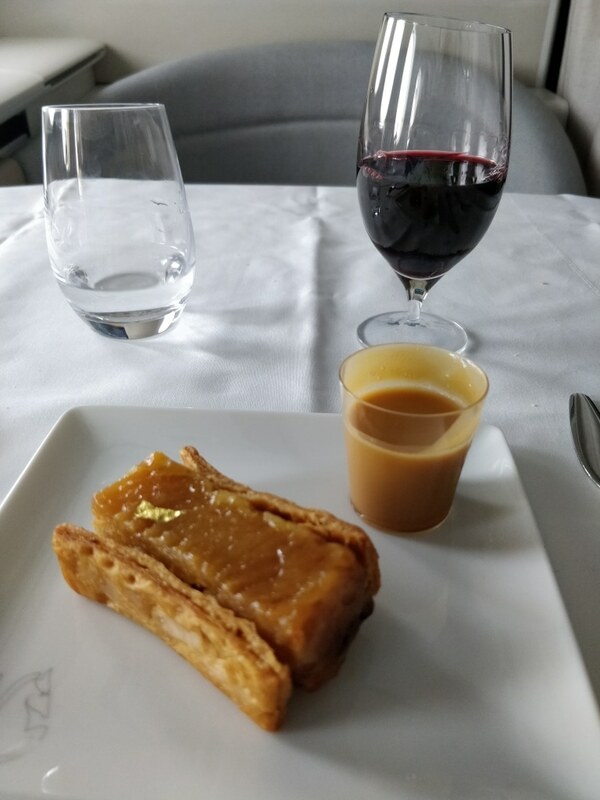 Pudding was a tarte tartin with caramel sauce. While I don’t particularly like pastry, I can appreciate that it was good pastry – adequately flaky and crumbly without the veneer of grease on the outside that pastries sometimes get. The caramel sauce wasn’t too sweet either and the whole dish came together quite nicely. I’d say the only let down was the gold leaf which just feels a bit tacky. The port (Graham’s 2009) was a pleasing colour but the flavour was a little muted. While I don’t like EK J, I do think their Port game is strong and more to my taste than this was. 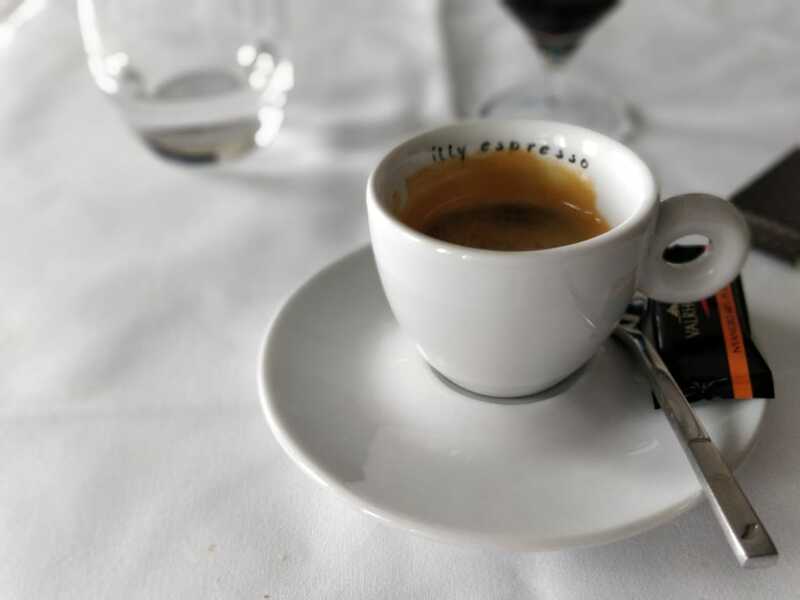 I then finished up with an espresso which came with a Valrhona dark chocolate (70%) which wrapped up the meal nicely. 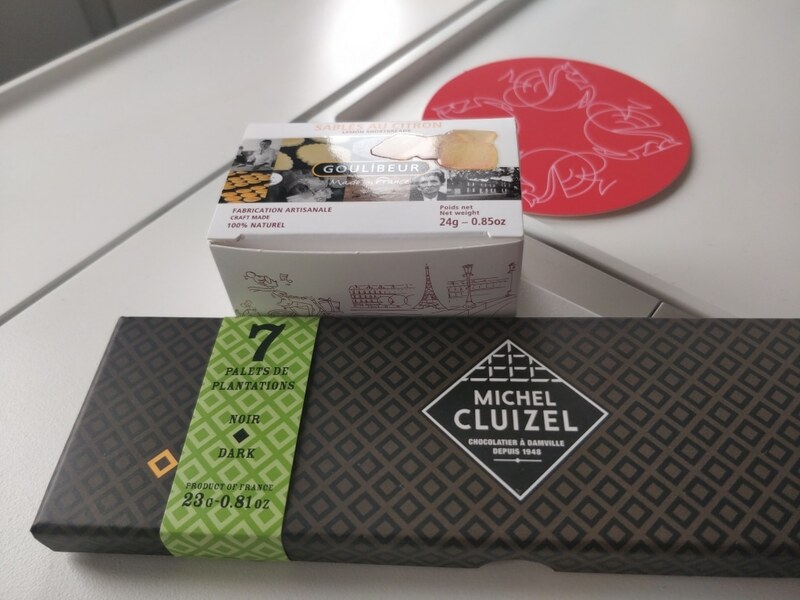 Incidentally, QR also went through a phase of giving out Valrhona chocolates in business, but I think they’ve fallen to the latest round of enhancements. With the meal done, I had some time to sit back and ruminate on the experience for a while before we began our descent. So, the 120,000 mile question – was it worth it? Maybe. Let me be clear, the whole experience was just that, an experience. Bar some minor details, it was fantastic and as advertised, and in many ways, completely over the top. It will take me a while to earn enough Flying Blue miles to do it again and I don’t see myself paying revenue fares for it, so I’m unlikely to be back in it this year, but I’m not sure that it upsets me. I’m very glad to have done it as it’s sort of a boss level of points redemptions, and I would have always been curious had I not. But now that it’s done, I’m not sure I need to do it again. Obviously if I were indifferent to the cost or didn’t have a more interesting use for the miles, it would still be a great way to get to/from Europe, but I don’t find myself daydreaming of my next La Premiere experience. Hi. Great review. Thought of doing this. But you will need to have status with Flying Blue for Air France F redemption yes? Thanks.